That’s just amazing. What great prices! No Office Max in these here parts. Did you need any coupons to get those deals? You could have gotten double the limit since you are a teacher; just ask about teacher limits next time. See how I did at OfficeMax. Should have seen above post before going, and I would have picked up more composition books. Do you have some proof of homeschooling yet? (I know your kids are young, and in my state you have to wait until they are 1st grade before getting the official form.) If you do, go in and get a MaxPerks Teacher Card. Today was teacher day and I got an extra 20% off, plus I was able to get double the limit of the above items. They also had treats, plus a reusable bag with coupons, products (post-its, paperclips, a planner with coupons, etc) and a $5 off any purchase at Payless coupon. Jessica, I asked about signing up at my Office Max but was told that they don’t give the teacher card to homeschoolers. I was bummed because I went there tonight (8-1) just for the teacher perks. What kind of form are you talking about? I’m sorry your Office Max didn’t let you participate! You can apply for a MaxPerks for teachers card online as well, so maybe that will work for you. In my state we have to file paperwork with the state in order to homeschool. We get a form that we can print off to prove that we are homeschoolers, and are often able to use this to get educator’s discounts. Another option that some stores might accept is a membership card to a homeschooling organization (either local or national). I guess YMMV depending on your state and your stores, but here is a list I put together with some national chains that offer educator discounts to homeschoolers. Thanks, Jessica! The only form that I’ve had to fill out is the Declaration of Intent to Homeschool. I sent Office Max a note so we’ll see! For those of you who don’t have an Office Max close to you (like me), don’t forget that Office Max, Office Depot, and Staples all price match. All you have to do is show the flyer from the store with the price you want!! I went and with my 20% teacher discount and tax spent 21 cents. I got two rulers, two boxes of 24 ct crayons and two 10 pack of dixon pencils. and the best part was that when I opened my wallet to see what change I had….two dimes and a penny was all I had. PERFECT! The manager at the local OfficeMax allowed me to get the limit for everyone in my party(myself and 3 school-age children). I just had to complete separate tranactions. 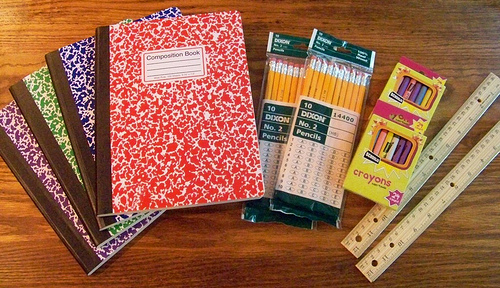 8 Schoolio 24 pk crayons, 8 packs of Dixon 10 ct pencils, and 6 wooden rulers for a total of 98 cents.